Many tablets are appearing on the market today, but they have their limitations in terms of processing power. Panasonic have made a name of themselves in the rugged market, and their ToughBook series have done well over a period of a decade. Today they have announced the world’s first fanless 7″ Windows 8.1 Pro fully rugged tablet, powered by an i5 vPro Processor. It combines the mobility and flexibility of the small size with its rugged and business focused design to create the Toughpad FZ-M1. The tablet features the 4th generation Intel® Core™ i5-4302Y vPro™ processor. This powerful new processor belongs to Intel® Core™ i5 CPU family. It delivers exceptional performance with a very low power consumption of just 4.5 Watts, compared to the regular 15 Watts, keeping heat generation to a minimum. The Toughpad FZ-M1 comes with 4GB RAM (8GB optional) and 128 SSD (256GB optional). It weighs just 540g, is 18mm thin, and is also highly flexible in terms of configuration ports and integrated expansion port. This means that the device can be configured exactly for the needs of the business and transformed from a tablet to a mobile tool for different applications. Configurable integrated options include 4G mobile broadband, GPS and vehicle pass through antenna. The integrated business expansion module options include Mini-Serial, LAN, NFC, Smartcard Reader, 1D/2D Barcode Reader, UHF RFID and battery hot swap capabilities. As standard, the Toughpad FZ-M1 includes a full size USB 3.0, Micro SD, Headset, DC-In and microSIM. It features a strengthened glass, high contrast ratio and 500 cd/m sq high brightness screen, paired with Panasonic’s anti-reflection layer. The screen is WXGA, featuring a 1280 x 800 resolution. Being a Toughpad of course means that it comes with some toughness. It has been drop testing to 150 cm, and has an IP rating of IP65. It is also temperature tested between -10 to 50 degrees C.
It promises an 7 hour battery life. 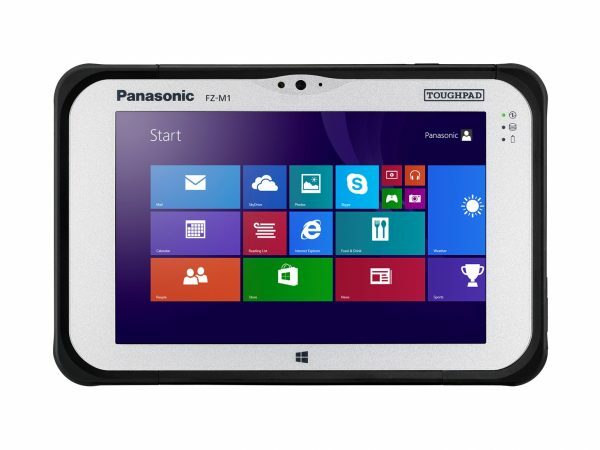 The Toughpad FZ-M1 will be available from February 2014 at a starting price of £1,183.